I was visiting my Mom, my brother Rob, and his lovely wife Bonny in Memphis, TN this past weekend. Lots of fun. Deeelicious food. And a chance to see how spring is busting out in another part of the country. Usually epiphanies about life touch us in unexpected places. Touchstone moments that can be easily lost in the shuffle. I find it pays to be alert. Bonny and I took their awesome Husky (Sampson, the tail-wagging, kiss monster) for several walks around the community. A flowering extravaganza. Spring is…well….springing. I was really struck by this one gorgeous tree in their neighbor’s yard. 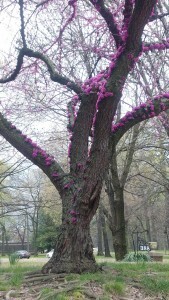 Not only is it covered in beautiful pink flowers. But the flowers are literally growing up the trunk. And I literally laughed out loud. After all, if you’ve got beautiful pink flowers to share with the world, why limit yourself to a few sparsely embellished branches? Sure, there are many gnarly, worn roots. And some dead limbs here and there. But who cares? Look at the flowers! 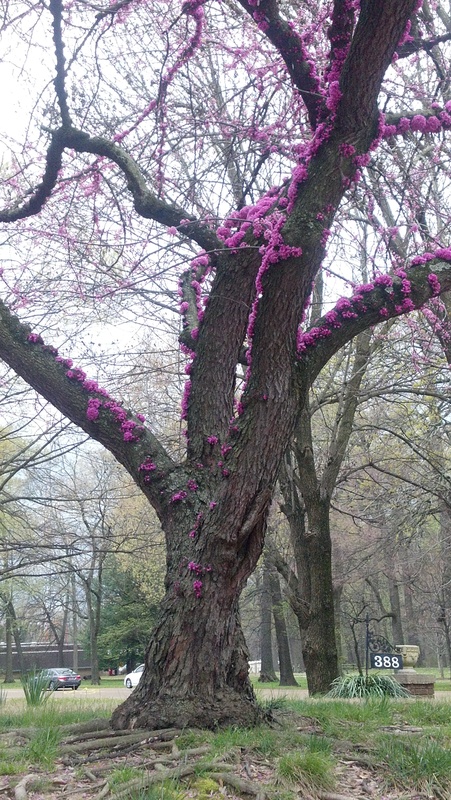 This tree is not settling for showing its true colors in a small, bashful way. Busting out, indeed! I was reminded that each of us is gifted with true colors. Unique, curious, inspiring, delightful, stop-and-take-a-picture qualities. As a practitioner, this is a critical concept for each of us to embrace. People are just waiting to be inspired by what we have to offer. Inspired to hope. To relax. To trust. To finally honor themselves in getting the support they need. To open up and share what they too have to offer. To be heard. Yet how many of us are marketing ourselves or speaking out to our audience in a small way? Or in a reserved, self-conscious way? Where we are so worried about showing our roots that we hide our flowers? Or an I-don’t-want-to-offend-anyone, please-like-me, or I-am-not-a-fraud kind of way? Perhaps sharing only a few examples of our strange and exquisite flowers here and there. Afraid that someone won’t think they are beautiful and compelling? When truthfully, they are breathtaking. Or even worse, trying to be like someone else? Trying to copy someone else whose colors we believe will be more acceptable…more credible…more true? When the people who most need your help are actually waiting to see Your true colors. To know for sure that you are the one they’ve been waiting for. This week I encourage you to lean into your own Spring. Are you letting yourself bust out in the ways that are most joyful and liberating to you? Are you authentically sharing and marketing yourself with Your true, glorious colors? In your newsletters, blogs, and presentations, are you speaking with the authenticity and intensity that you use with a treasured friend? If not, then why not? Here’s a concept that we all know well and probably discuss with our clients and patients… When we repress our true nature and who we most want to be (worn roots and all), the body has to hold in all of that unexpressed potential. And all the critical, insecure, self-judging thoughts we have about it too. A big job. Often the body struggles and starts to fail with the burden of that task. Are you personally following the sage wisdom you would give a client in this area? I used to struggle with this unwillingness to share my true colors in a big way. And it held me back in my growth – professionally and personally – in a large and painful way. My body thought a good way to protect me from all that apprehension and holding back was to build a 20+ pound Michelin Man suit. Extra body fat, protecting me from what I couldn’t open myself up to. When I finally let it all go and allowed myself to bust out, the suit faded away. My joy arose. And my business soared. Here is what I want for you: Set yourself free. Are you looking for a sign? Okay: this is it. Let go already. Choose to Be Well. I usually sign my emails with that valediction. I imagine many people think mistakenly that I mean “be well” in the sense of being healthy. Actually, I mean “Be” as in Be You. Open up. Live. And do it Well. Do it with gusto. Fully expressed. Uninhibited. Showing all your true colors. And let flowers grow up your trunk. Let the world stop and take a picture. And marvel at your beauty. And choose you as the ideal practitioner they’ve been waiting for. Thank you Tracy for your beautiful message! Just what I needed to hear! Still not too warm here..but saw a beautiful cardinal yesterday. I always feel it’s my Dad checking in with me. Telling me to keep going! Thank you for the inspiration! My husband always says that I need to speak to others the way I speak to him because I don’t hold back when I speak about health or life’s cares with him. I am growing bolder every day. I love it. Such a beautiful tree and message. Thank you! 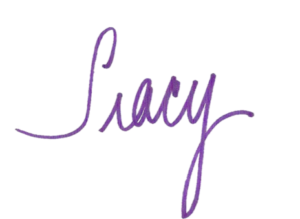 Tracy, thanks a lot for this inspiring and empowering message. Right on the timing! I need it and i love it. Yes, start demonstrating my true colors, and let people stop-and-appreciate this authentic and genuine me! Open the door for me to get into their life transformation. I am loving it!! What a beautiful message, and couldn’t have come at a better time. Thank you so much for sharing this – I needed to hear it today. I’ve actually been talking to my business coach about this same thing. Love it! Wow! What a beautiful email in my box this morning! Thank you Tracy. It’s such a simple concept and yet so many of us need to be reminded of it. You made my day! Thank you Tracy! I absolutely love this, and as usual, your message is in perfect timing for me to hear. Thank you for sharing so freely of yourself. You are very inspiring! Aaah dear Tracy, you have a way, a beautiful wise way of deep expression which prompts that inner light we all have, to shine. Mine needed to be given this picture, these words , words of appreciation of beauty and excellence to let my flowers blossom . with love and gratitude. Thank you so much for sharing your heart! Your message ALWAYS so timely!!! This is perfect synchronicity for me today. 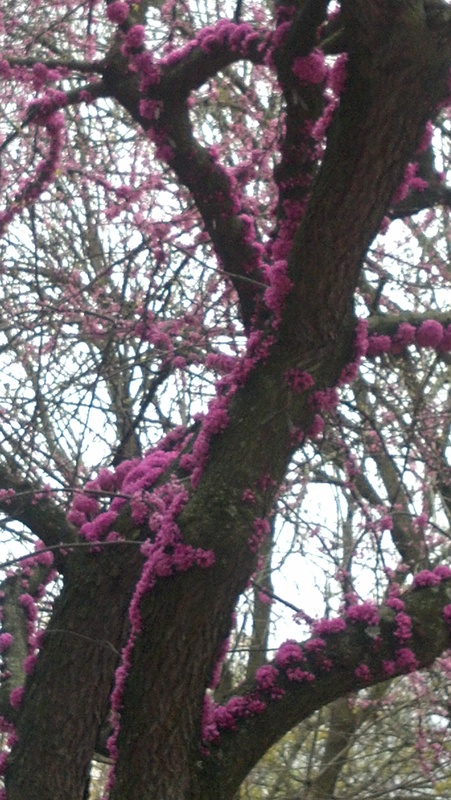 Earlier this AM, I was just checking all the red bud blooms on my red bud trees today, and for the first time they are going to bloom, all three of them. I was absolutely thrilled because I jut adore red bud trees. And I take your message which is true of me as well! I’ve been feeling that way myself. Good one Tracy. Beautiful tree, flowers, and inspiration.